Nestled amid the contours of the South Downs in the heart of Hampshire, Meon Springs is a hidden gem. Although we’re just an hour or so drive from London, we’re a million miles away in terms of peace, quiet and relaxation. The ancient South Downs Way runs through our 1,200 acre working dairy and arable farm. Whether you’re walking, cycling, fishing – or you just want to chill out – this part of Hampshire and the Meon Valley has it all. 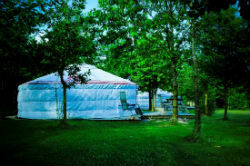 Our authentic Mongolian Yurts are perfect for families looking to get away from hustle and bustle of everyday with plenty of space for kids to run around and ride their bikes. 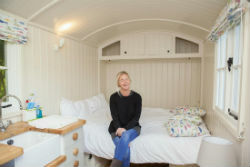 While half a mile away, our shepherd’s huts are made for couples or solo travellers to relax and unwind. 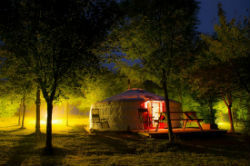 Whether you’re hunkered down in our authentic Mongolian yurts or snuggled up in our traditionally-built shepherd’s huts, staying at Meon Springs allows you to look out for number one – you! Because a visit to Meon Springs is all about you. Just relax. Chill out. And breathe. 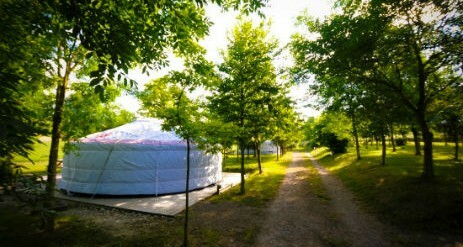 We have six yurts set among trees with great views of Hen Wood, the South Downs Way and old Winchester Hill. 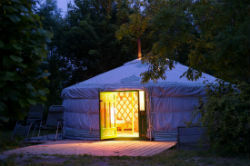 From the lattice frames and ornately painted panels to the thickly insulated canvas walls, each yurt has a charm of its own. The beds are made up with crisp clean linen and warm duvets to keep everyone safe and sound even in wet and windy weather. 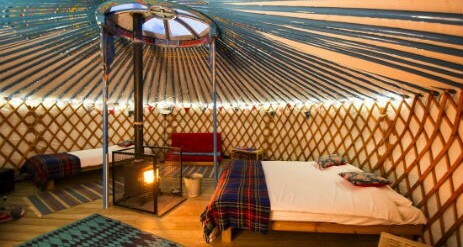 And there’s a wood burning stove in the centre of each yurt that keeps you toasty warm even on the coldest of nights. 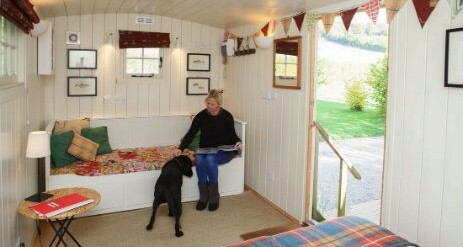 The Yurtery is a large centrally heated communal area, in which families and visitors can chill out. 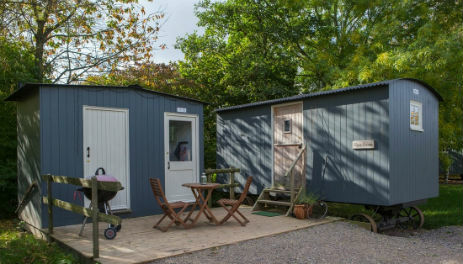 In there, you’ll find a fully-fitted kitchen with worktops, sinks and equipment, your own individual fridge, two shared cookers big enough for the Sunday roast. Plus, there are three large wet rooms, with piping hot showers, loos and sinks. It’s a real home from home. 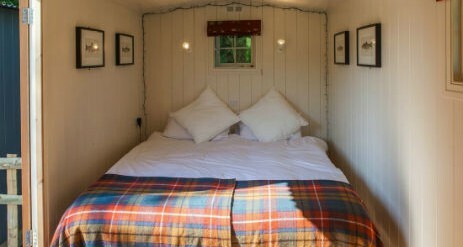 We have four shepherd’s huts available for people to stay and unwind. 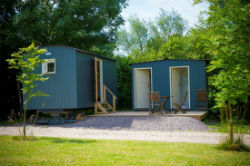 The huts are self-contained, each with its own toilet, shower and kitchen. 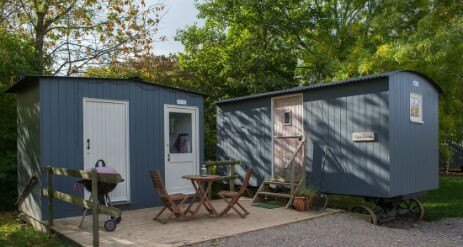 The huts are tucked away in between a line of trees and Whitewool Lake and each is fitted with heaters and power sockets. 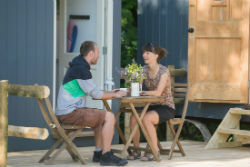 Outside, there’s a decking area, seats, a barbecue and expansive views over Eighty Acre Field and Hen Wood. accommodation for walkers and cyclists who are looking for a base for an active holiday. Meon Springs is one of Hampshire’s finest fly fisheries. The four spring-fed lakes have been attracting anglers for more than 30 years providing top-drawer fly fishing sport for novices and expert anglers alike. 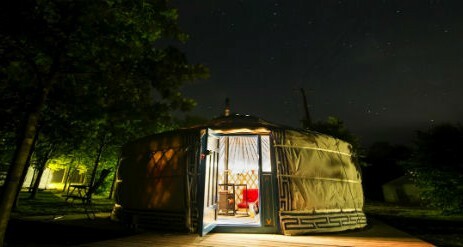 For people staying with us – either in the yurts of huts – fly fishing free. If you’ve never fly fished before, then make sure you team up with one of our instructors to learn what it’s all about. Whether you opt for one-to-one tuition or you join us for our ever-popular Experience Days, our instructors are here to make sure you have a great day out. You know what they say, when you catch your first trout on the fly it’s not the fish that’s hooked…it’s the fisherman. There are some wonderful country lanes around here perfect for walking or cycling. Of course, if you don’t have your own bike we have a dozen or so mountain bikes for you to hire as well as a range of simple to follow routes for you all to enjoy. We are a working farm, and all our milk is sold to Sainsbury’s. So if you’ve ever picked up a pint from the supermarket, you may well have drunk some of our milk. Milking is done every day, twice a day. And since you probably don’t want to visit the dairy before the dawn chorus has woken up, you’re more than welcome to come and see us at four o’clock in the afternoon instead. There’s so much to see and do in Hampshire it’s difficult to know where to start. From medieval castles and cathedrals in Winchester, Salisbury and Chichester to the historic dockyard in Portsmouth there’s plenty to see and do. Then again, nothing beats mooching around the market towns and villages with award-winning pubs just a few miles from here. Whatever you do when you visit us at Meon Springs, make sure you don’t do too much. Build in time to relax. To Breathe. Make sure you make some time for you. Since this is self-catering accommodation you will need to bring your own food. There are shops nearby in Petersfield or you could have it delivered by doing an online shopping order with Tesco, Sainsbury’s or Ocado. On site, you can also purchase a limited selection of food and drink from our café. And don’t forget to visit the local country pubs – The Shoe at Exton, The George at East Meon and the Thomas Lord at West Meon all deserve a visit. All the wood for your wood-burner and campfire is supplied free of charge. We also supply firelighters. Other than that, we provide the bed linen so all you need to bring are your own towels. Oh, and don’t forget your toothbrush!